I’m delighted to announced that my new book is out now and available to buy on Amazon, both as a paperback and as an ebook. Perilous Path: A Writer’s Journey is a short informative and encouraging book of 126 pages, giving an insight into the writer’s life. It will appeal to aspiring writers, keen readers fascinated by the subject of literary inspiration and creativity, and anyone interested in how fiction writers get their ideas and go about creating full-length novels. How do you find courage and motivation when your novel sinks in the middle? How do you stay focused as a writer through success and disappointment? How can great artists, musicians and psychologists give you inspiration? You’ll find the answers to these questions and many others in this book. Each chapter is a short article based on original material I’ve previously published online in answer to FAQs aspiring writers type into search engines. And I can certainly say that before I get back to completing my new novel ‘Director’s Cut’, I’ll read through ‘Perilous Path’ myself paying close attention, because I need to take my own advice! ‘I found it fascinating to read how one new writer began to write, and continued to self-motivate in her determination to achieve her goals – and how her faith provides example and inspiration. Some of the articles contain ideas about writing that I haven’t considered previously; some of them are more like friendly reminders of things I already know, or focus on interests that (like many readers and writers, I imagine) I share with the author. The book costs £4.74 for the paperback and £2.42 to download on your Kindle. And if you do read and enjoy it please remember to leave a review on Amazon! I’m delighted to reveal the cover design of my new book which is due out soon: The cover was created by graphic designer Annabelle Bradford. Perilous Path: a writer’s journey is a short non-fiction book (106 pages) which will be available both as a paperback and also as a Kindle ebook. It’s in the Self-Help / Creativity category and it’s for aspiring writers, keen fiction readers fascinated by the subject of literary inspiration and creativity, and anyone interested in how fiction writers get their ideas and go about creating full-length novels. How do you stay focused as a writer despite all the setbacks and disappointments? You’ll find the answer to these questions and many others in this book. SC Skillman offers deep insight into the faith and hope that is vital for one who walks the perilous path into the ‘promised land’ of the writing profession. Every chapter is an article previously published on the author’s blog Inside the mind of a writer, in answer to FAQs aspiring writers type into search engines. For a sneak preview of the book, you can read one of the chapters in full here. I’m pleased to announce I have a new book coming out soon, this time non-fiction. It will be a short one, 100 pages, and will be available in paperback as well as an ebook. I’ve written it for all those who’d love to know about the process of writing novels: whether they be aspiring writers, or simply keen readers who are curious about how novelists think up their ideas and go about creating fiction from them. How can Carl Jung’s theory of archetypes help you in your creative writing? Always on the outside looking in – does a bestselling novelist have a lesson to teach aspiring writers? Each topic has a chapter to itself, and the book contains 33 chapters. More soon when I’ll let you know the title and give you the cover reveal! I’m currently working on a new book about writing, which has the working title of Perilous Path: a Writer’s Journey. The book contains 30 short pieces I’ve published online over the past 6 years, both on ezine articles and on this blog, all on the subject of writing a novel. Here’s a taster from the book. And below the article I’ve posted the current Contents List of the book. I’d love to know if, having read it, you feel you or an aspiring writer you know might be interested in such a book – and whether you would buy it as a paperback or would find it more appealing as an ebook. Over to you, my online audience, for your views and comments! How big a part should the internet play in a novelist’s research? My mind is immediately drawn to a quote from Dan Brown’s novel The Lost Symbol. How often, muses Robert Langdon to himself, has he advised his students that “Google is not a synonym for research”. I couldn’t help laughing at the sly irony of that. For I defy anyone to read this novel without wondering how long the author spent on Google researching his subject matter; and how soon you will get onto Google yourself after reading it, to corroborate his facts – or to fall into the very trap Robert Langdon warns against! Therefore the internet is a valuable tool, but cannot serve as the sole source of material when researching a novel. 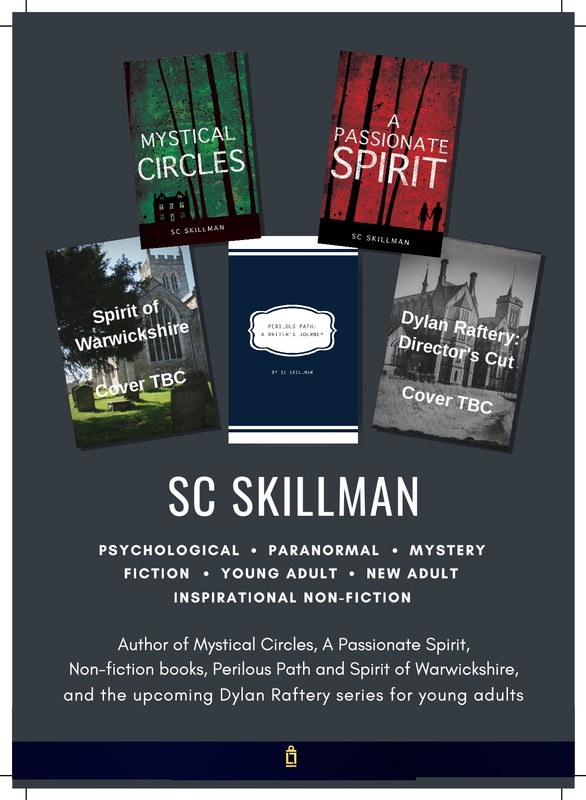 I may take as an example the Cotswolds location for my first published psychological thriller Mystical Circles. I was inspired by three places. Firstly Totleigh Barton at Sheepwash, near Beauworthy in Devon where I once attended a five day Arvon Foundation poetry course: it boasted a monk’s room, as does the farmhouse in my novel. Also the diverse group of students on the course inspired me for the group dynamics of my story. Secondly my imagination was fired by the Lygon Arms Hotel in Broadway in the Cotswolds, a wonderful setting for a psychological thriller. My favourite piece of research involved afternoon tea there. The manager took us for a tour of some of the historical rooms in the hotel including the Cromwell Room. The owners of the inn were neutral during the English Civil War and thus hosted guests on both sides of the conflict. I used some of the details of the interiors here in my descriptions of the sixteenth century farmhouse. And thirdly, for my setting, although I ultimately chose the Cotswolds as my favoured location, I was also inspired by a farmhouse near the Forest of Orleans in France owned by the eccentric uncle of my then boyfriend. We visited his uncle there several years ago. When I met him, he displayed a love of practical jokes, leaving plastic rats and spiders for me to find in odd corners. He also owned a parrot, which I came upon by surprise in his sitting room, exactly as I describe my main protagonist Julie coming upon the gold and blue macaw in Mystical Circles. I hope all this will serve to illustrate how every aspect of your life can be regarded as research for your novel. Life itself is one long process of research. Bad experiences and good, failures and humiliations… nothing is wasted, or lost. Surely this is the ultimate recycling! – it is certainly one of the things I most love about fiction writing. How can Carl Jung’s theory of synchronicity help you in your creative writing? How can Carl Jung’s theory of The Shadow help you in your creative writing?